My son was home this summer after graduation from college. His only “job” was to study and take the CPA exam. Before two of the three tests (four in all) he took this summer I made him his favorite “go to” power breakfast. In a large bowl, preferably a pie plate, add first five ingredients. Slice bread in half length wise from top to bottom. Add to the egg mixture being sure to coat all sides of the bread. Let sit while heating a griddle. Heat a griddle (or a heavy skillet – you will have to do the toast in a few batches) to medium heat. Add butter and spread over skillet. Cook first side until the bread moves easily, no more than three minutes. Flip bread and cook for about two more or until bread is golden brown. 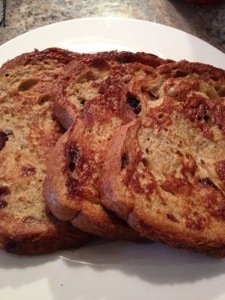 My son takes his final part of the exam on Monday…what I wouldn’t give make him some French Toast for his good luck breakfast! In a large bowl, preferably a pie plate, add first five ingredients. Beat until combined. Slice bread in half length wise from top to bottom. Add to the egg mixture being sure to coat all sides of the bread. Let sit while heating a griddle. Plate two pieces per serving (or more :o). Top with your favorite toppings. What a good Mum. I hope your son passes. Thank you, Gary…me, too! He is 450 miles away so no breakfast on Monday for him. He has to worry about getting a train in NYC and hope the testing center has power. The city is slowly coming back.